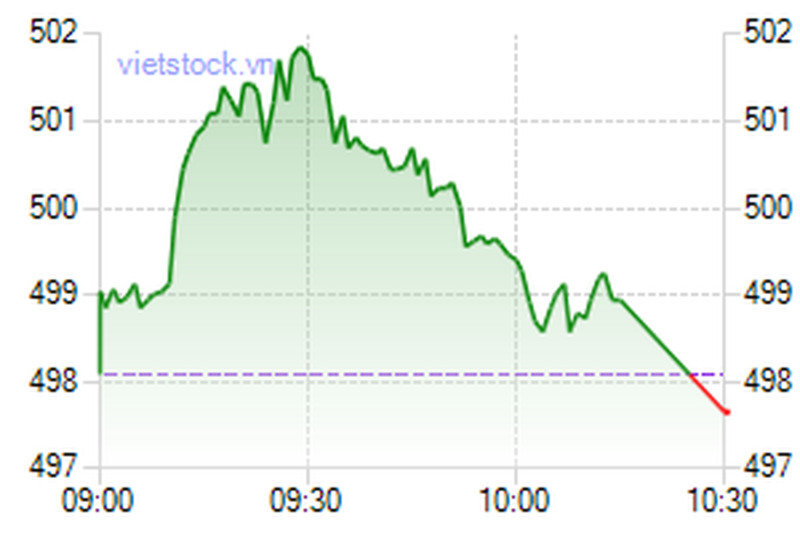 The VN-Index unsuccessfully returned to the psychological resistance mark of 500 points on July 27, sliding 0.09 percent, as most stocks suddenly dropped at the end of the trading session. The benchmark of 250 companies and four mutual funds listed on the Ho Chi Minh Stock Exchange finished at 497.67, eroding 0.43 points. Among the index members, 65 gained, 148 dropped, while 41 remained unchanged. Liquidity improved faintly. Around 43.16 million shares, worth VND1.33 trillion, changed hands. Saigon Thuong Tin Commercial Bank or Sacombank (STB), with 3.04 million shares changing hands, was the most active share in volume for the third consecutive day. Thanh Cong Textile Garment Investment Trading Joint Stock Company (TCM) came next with 2.49 million shares traded, up 3.14 percent. The company announced that it bought 7,002,900 shares of Thanh Cong Securities Company (TCSC), increasing its holdings ratio at TCSC to 19.45 percent on July 21. On July 22, the company signed a contract to assign 45 percent of its assets at Thanh Chau Joint Stock Company, reducing its holdings to 5 percent of Thanh Chau Co.’s chartered capital. Refrigeration Electrical Engineering Corporation (REE) tagged along with 1.61 million shares. DIC Investment and Trading Joint Stock Company (DIC), which gave up 4.99 percent to VND36,200, led the losers on the city bourse. Techno - Agricultural Supplying Joint Stock Company (TSC) slashed 4.87 percent to VND25,400. From July 27 to September 29, Nguyen Thi Chau, wife of Le Van Phuoc – member of Board of Directors of Techno - Agricultural Supplying Joint Stock Company (TSC), registered to sell 30,000 shares, decreasing her holdings to 20,000 shares, improving her family’s finances. Ho Chi Minh City Metal Corporation (HMC) declined for a second day, losing 4.85 percent to VND21,600. Meanwhile, Hoa Binh Rubber Joint Stock Company (HRC), and Investment Commerce Fisheries Corporation (ICF) both hiked the daily maximum allowed limit of 5 percent to VND63,000 and VND16,800 respectively. From July 28 to September 27, Le Huu Cong, brother of Le Hao – member of Board of Directors of Hoa Binh Rubber Joint Stock Company (HRC), registered to sell all 1,540 of his shares, balancing his family’s finance. Hanoi-based Lilama 10 Joint Stock Company advanced 4.9 percent to VND40,700. 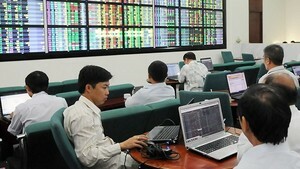 The Hanoi-based HNX-Index lost 0.78 points, or 0.5 percent, to 154.92. Trading volume was at 31.1 million shares, approximately VND879 billion. The UPCoM-Index closed down 0.46 percent, or 0.25 points, to 54.06. Around VND6.2 billion was spent on 337,500 shares as of 11am local time.